Sometimes things just keep popping up in our lives, when I wrote my second book Easy-to-Sew Playful Toys one of my favorite toys I designed was a monkey. Appearance #2, the Sock Monkey is a classic toy which has been around for many years. It has enjoyed a resurgence in popularity in the last few years. The Fox River Mills Company manufacturers the Fox River Red Heel Socks. Each pair includes the pattern and cutting diagram for making a Sock Monkey. A couple years ago I was asked to design a Sock Monkey using STYROFOAM TM Brand Foam. 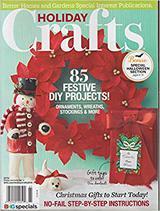 He appeared in Crafts n' Things magazine. Appearance #3, a few months ago the Designer Crafts Connection Blog Hop featured When Creativity Knocks Sock Monkey DVD. We were asked to create a Sock Monkey or some creative version. I opted for the classic even though I made him inside out! I took him off to have an adventure with some wood toys. The next thing I know I am discussing providing samples for the Toronto Gift Show, happening the same time as I was away for the CHA show in Anaheim! I had to redraw my own pattern from the Fox River Mills instructions, add string jointed arms using upholstery thread and embroidered eyes, facial features for safety, register my filling content. 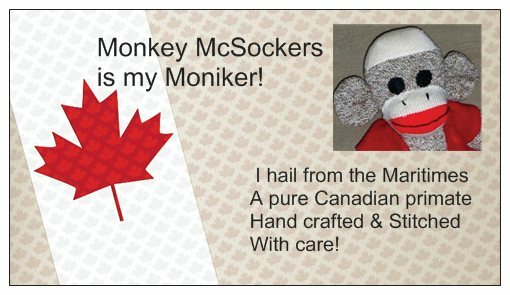 Monkey McSockers was now ready to venture across the country! Here is part of the gang getting ready to leave the nest and venture off to stores across Canada! Looks like you're open for a little monkey business! Good for you! I remember the Sock Monkey you made for C&T, too -- so cute! Dina really loved him, too. Debra - that is quite a pile of monkey business! Sending you love and happy packing!